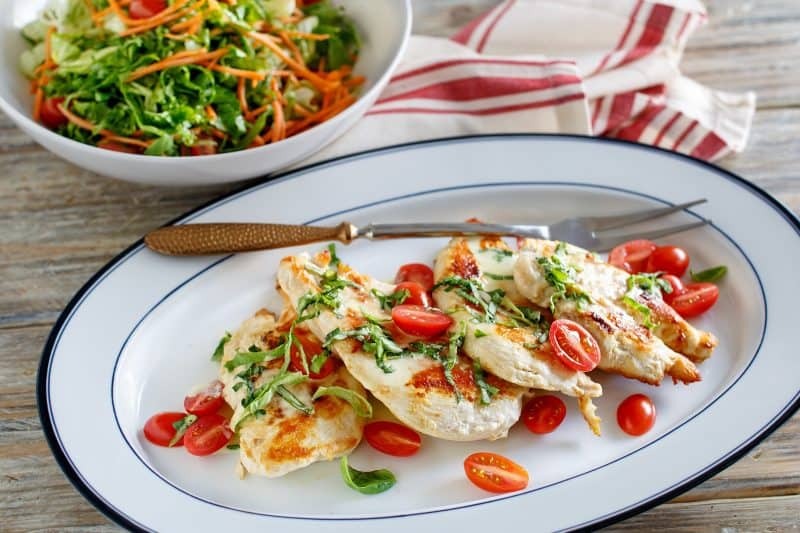 Velvet Chicken – Low Carb & Keto! This is a wonderful low carb recipe, well suited for a variety of diets (including Low carb and Keto). The rich velvet cream sauce will have you tempted to lick your plate! Velvet sauce is made by reducing chicken broth in a pan that you’ve sauteed meat in, then thickening it with a wonderful heavy cream. I first developed this sauce a few years back for pork chops but since we’ve quit eating pork I adapted it to chicken and was thrilled to find it works just as well. Think of it as a low carb rich and flavorful gravy for whatever you happen to be serving. I like to brighten things up a bit for the spring and summer seasons by adding grape or cherry tomatoes and some fresh basil but you can leave those out if you want to keep it simple. If you want to hop to the recipe, scroll down until you see the printable recipe card. If you’ve got time to visit a minute, grab a glass of something and keep reading. Today, the view from my window shows sunshine, green leafy hydrangea bushes, and trees covered in spring blossoms. The birds are singing a happy tune and all of nature seems to be excited about spring. Now that the pollen clouds have dissipated, we’re able to get outside a bit more and I plan on heading out there with a glass of iced tea once I finish up this post. I try to step out from time to time throughout my day as I’ve found it works wonders on my state of mind. When the weight of the world bears down on me and these walls seem to close in, stepping outside and seeing the greatness and beauty of the sky and the world around me helps me to put things in proper perspective again. It is one of the greatest anti depressants I’ve found! I want to encourage you, today, to spend a little extra time in nature, even if it is as simple as standing outside in your back yard. Better yet, go for a walk and talk out your thoughts with the Creator. You’ll be amazed at the profound difference something so simple can make. 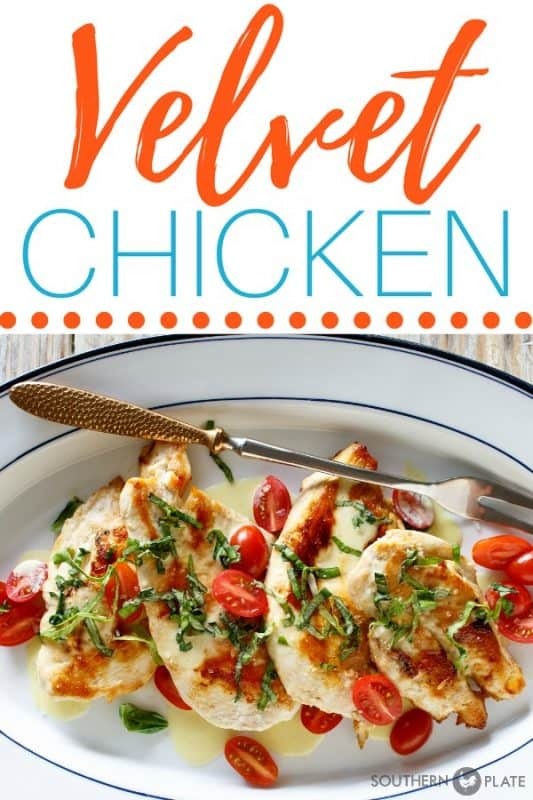 To make this chicken you’ll need: 2-4 boneless skinless chicken breast halves, chicken broth, heavy cream, butter, and salt and pepper to taste. You’ll also need fresh basil and grape tomatoes for garnish – if you like. Melt butter in large skillet over medium high heat. Add chicken and salt and pepper tops of them. Cook until browned, then flip and salt and pepper again. Continue cooking until opposite side is brown, about 2 minutes each side (rough estimate). Once broth has cooked down, remove chicken from pan and turn off heat but leave pan on the stove eye. Have a wooden spoon handy and pour the cream into pan. Immediately start stirring and continue until the pan remnants are fully blended in with the cream and cream is warm and thick, just a few minutes. Serve chicken with delicious cream sauce spooned over them. Garnish with sliced grape tomatoes and fresh basil. This is so good! I hope you get to try it soon. It is a satisfying dish and a delicious way to liven up chicken! Melt butter in large skillet over medium high heat. Add chicken and salt and pepper tops of them. Cook until browned, then flip and salt and pepper again. Continue cooking until opposite side is brown. 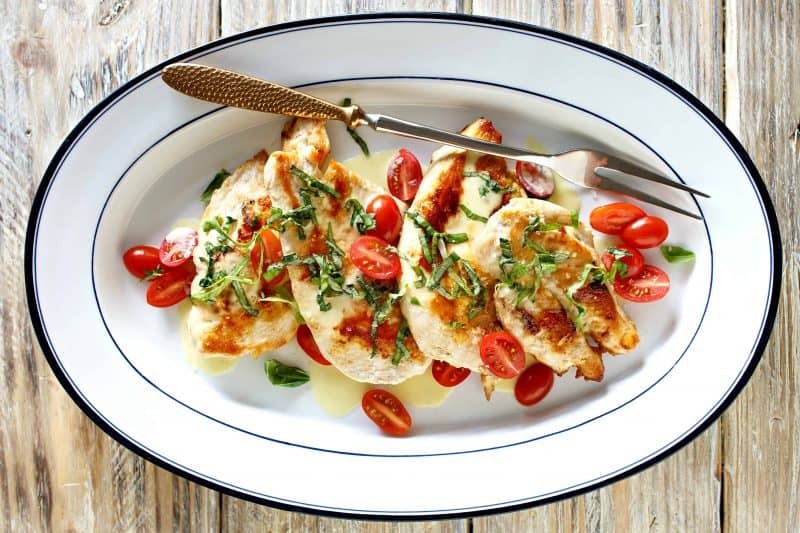 Serve chicken with delicious cream sauce spooned over them. Garnish with sliced grape tomatoes and fresh basil. Juicy Burgers with a surprise ingredient! This sounds so good. I need to try. Must give this a try! We LOVE the velvet pork chops, so I know this will be a hit as well! Let me know what you think once you get the chance to try it Teresa, I think you will love it! Wow, I can’t wait to try this. We just started low carbing/lazy keto and I’m so excited my favorite food blogger/author has got the recipes!! Thank you Christy! I hope you love it as much as we do April!! Let me know what you think and I appreciate the kind words!! This is for supper tonight! Thank you. Thank you so much, Heather! I hope y’all enjoy it! This sounds delicious and I must try it soon! But… I had to read your sentence “since we stopped eating pork” a couple times Until it sunk in. No. Bacon . That would be one hard decision for me! Thank goodness for chicken right? Lol, bacon is the first thing people go to and I do understand. As much as we used to love it, this has still been the easiest thing we ever did. I hope you have a great afternoon, Kristy! It’s so beautiful in Alabama, I’m sending sunshine to the rest of the world! I’ve made your velvet chops for years, it’s one of my favorite dishes. Can’t wait to try this version, and I’m Keto too, so it’s perfect. Hugs and thanks! Hugs back at ya Robin!! Could you use half & half instead of the cream? If so, I can make this meal tonight because I have a carton of half & half in the refrigerator now. Just curious… why have you quit eating pork ? We quit as a matter of faith. Thanks for asking and hope you have a great evening! Laura you mean , lol my grandad( RIP 1995 ) has called me Linda on occasion! I am the one that sent you the get well card when you fell off the and I put a lot of stickers on it ! Why on earth did I call you Linda?! I’m so sorry! That’s my mother in law so I guess L names just get typed out that way with me sometime. Please forgive me, this old brain!! Thank you ! You just made my heart smile again with thoughts of your sweet card!!! Oh SWEET Christy ! No biggie ! Y’all stay safe tomorrow in the predicted inclement weather ! 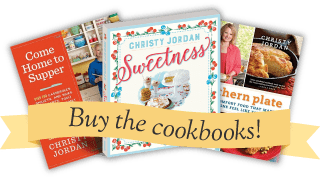 Christy, I want to thank you not only for all the wonderful recipes you share with us, but for the printable recipe card you include with each recipe. That makes it so easy to print the recipes I want or to save them to my computer if I’m not ready to print. Thanks! Thank YOU Nancy, I am so glad you are enjoying that feature!! Hi, Christy, The recipe calls for chicken breast halves. Does this mean to slice in half? Silly question, but the ones I buy are very thick. Not a silly question at all! 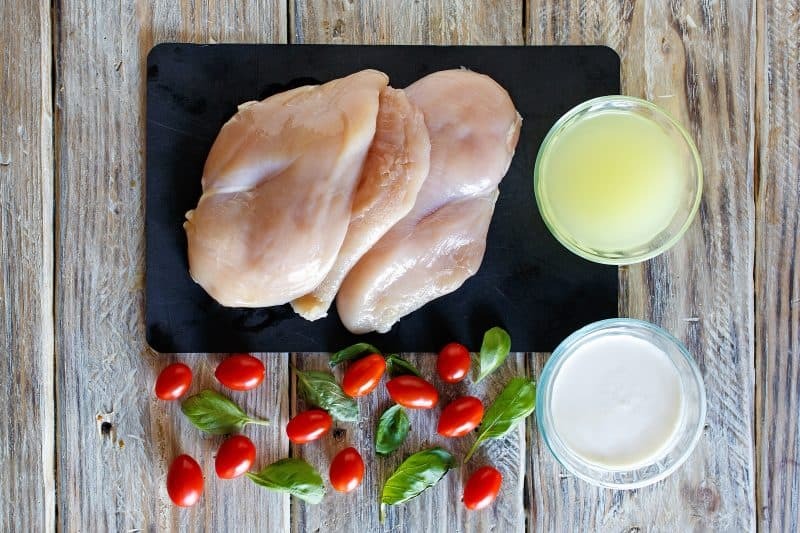 It was probably silly of me to specify as boneless skinless chicken breasts are already halves, but sometimes people get really technical and ask me (it is possible to find a whole boneless skinless breast, just not likely) and so for whatever reason I was prepared for that with this post! lol. Just boneless skinless chicken breast, as they normally come, works fine. If I confused you more know that I’m a little low on coffee today and please report back so I can clarify! Love your recipes and your heart. 🙂 Curious why you do not eat pork? Thank you so mucb, Amy! We quit eating pork a little over a year ago as a matter of faith. I would say we also don’t eat shellfish and a few other things but we never really ate those to begin with so pork is really all we gave up. Can you give me the nutritional values? Hey! I don’t give nutritional values here because it varies based on serving size and ingredient substitutions, but myfitnesspal.com is a great resource and where I calculate all of my values personally, it’s free, too! I made this tonight for dinner!! Outstanding!!! Will make again and adding it to my keto friendly recipes!! This looks delicious! We love the velvet porkchops and I am anxious to try this. Thanks for the recipe. Thank you Loretta, if you love the Velvet Pork Chops you will love the chicken just as much, if not more!! My sweet hubby and I finally decided to join the KETO crowd. I am SO GLAD WE DID! We’ve both lost 10 pounds in less that 2 weeks. Thanks to your recipes, it’s been easy. We’re having velvet chicken and zucchini fries today. So delicious and a man pleaser. Sure doesn’t feel like we’re on a diet. Thanks for always providing us with sensible, inexpensive and delicious recipes. Congratulations Sylvia!! I am so glad to hear your results so far and look forward to hearing even more in the future!! I pray God blesses you and yours as well! I love this recipe. I cooked this just for myself, so I had leftovers. I chipped up the chicken, added minute rice and a little more chicken broth. It made a delicious soup! Thank you, Christy. We appreciate you. That is genius Lisa!! Thank you for sharing!! I can’t find the symbol for the free recipe box. Hi Beverly, it should be on the far left side, around the middle of the page, it is just a small tab with a recipe box in the middle of it. Let me know if that helps. Hi, Christy! Are you still doing low-carb? I know you had great results. I’m thinking of going that route. 43 yrs old and weight is totally stuck. I’d love to lose about 50 pounds. You are such a blessing! I have your pulled lol with clear bbq sauce in my crock pot right now! I’m working out what I’m going to do, I’m kind of in the in between. I had some serious kidney stone issues and so had to leave low carb for a while and now I’m in the process of getting back in the saddle but I’m not entirely sure which horse that saddle will be on ;). Most likely I will do low carb but have some of the good carbs like oatmeal, sweet potatoes, etc. Thanks, Christy! Hope all goes well! Sounds so good I’m sure gonna try this very soon! I’m new to this low carb but so far everything I’ve tried has been delish!! ❤️ I’m so glad I found Southern Plate…. I am glad you found it too Karen!! So glad you are enjoying the recipes!! Do you have the nutritional values for this recipe! Gotta try this one! I don’t Carol but it is easy to get. Google nutritional values and insert the ingredients and it will give you all that you need. There are lots of sites that offer that service for free! This has become one of our “go-to” recipes. Since we are empty nesters we cut back on the amount of chicken and keep everything else the same. We then cook pasta, cut the chicken into pieces, add it to pasta along with the extra gravy to make a one dish meal. Great idea Larry!!! I am so glad you like the recipe and appreciate you sharing your tip with us!!! I am in love already, this looks so good! I am a fan of anything in a cream sauce, so I am putting this on my menu. I hope you like it when you get a chance to try it! !